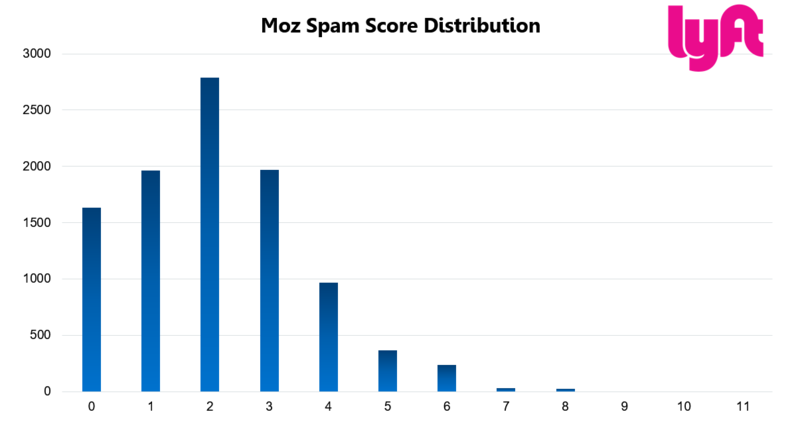 TL;DR – We analyzed 1 million backlinks via 10 random sample sets of 100,000 backlinks across 10 different websites from a variety of business verticals to determine how the link metrics from those backlinks would impact gains or losses in organic search visibility. If there was just one piece of advice I could give regarding link analysis, it would be this: don’t ever manually review hundreds of thousands of backlinks one by one. Seriously, don’t do it! You will burn out or fail (likely both) and your client/manager will be very upset with you for not making proper use of your time. 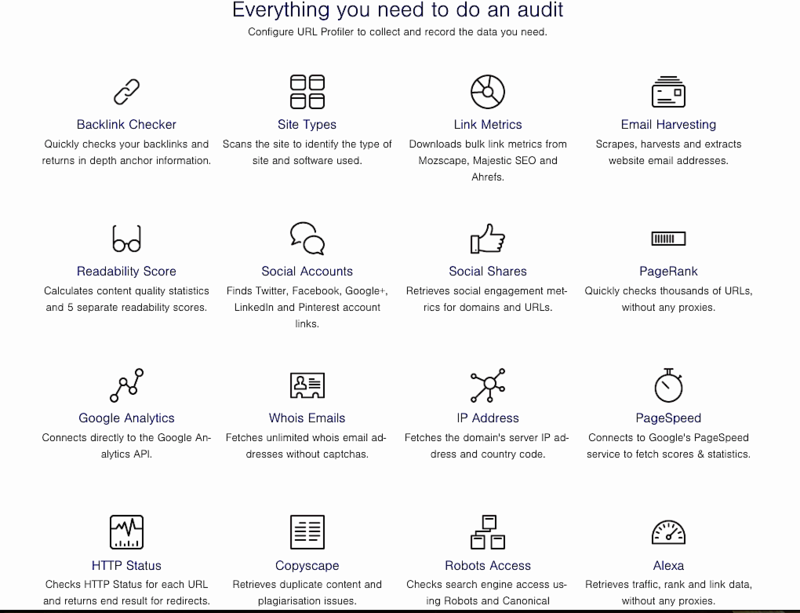 What you should do is look for patterns, trends and commonalities among link metrics for a given set of URLs to identify unnatural links. 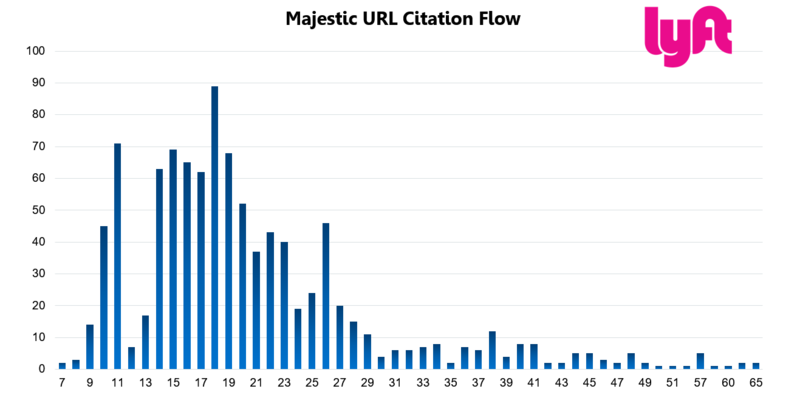 Majestic Citation Flow – Rates how influential a URL may be based on how many sites are linking to it, based on a 100-point scale. 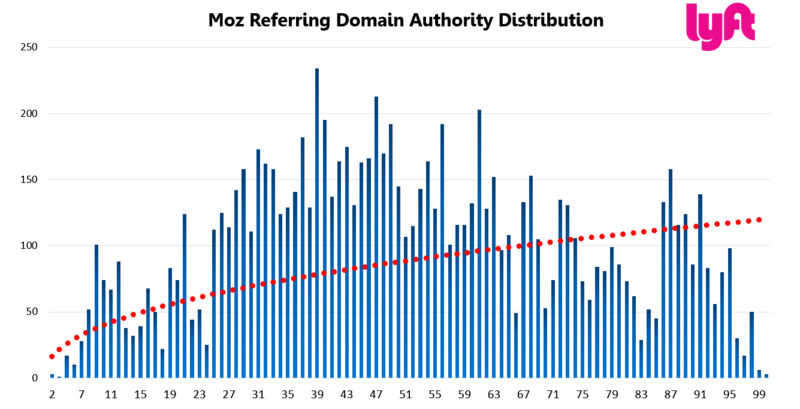 Moz Domain Authority – An overall website rating that is calculated by metrics such as linking domains, number of total links, MozRank, MozTrust; into a single 100-point logarithmic score. AHrefs Referring IP C-Class Diversity – IP Addresses are divided into lettered blocks (AAA.BBB.CCC.DDD). The more referring C Class Duplicates that exist within the link profile indicates the site is likely to be engaging in link networking. Lyft is an on-demand ridesharing/taxi service, available in most major cities across the U.S. with possible global expansion soon. Lyft describes themselves as “your friend with a car, whenever you need one.” Download their mobile app and get a ride from a friendly driver within minutes. Before I even got into their backlinks, I was curious to see if Lyft was taking advantage of any non-branded organic traffic. The ridesharing service industry is one that heavily relies on branding and trust. Think about it: you’re putting your life in a complete stranger’s hands! Because the industry is so brand-centric, most of the keyword opportunities are branded. 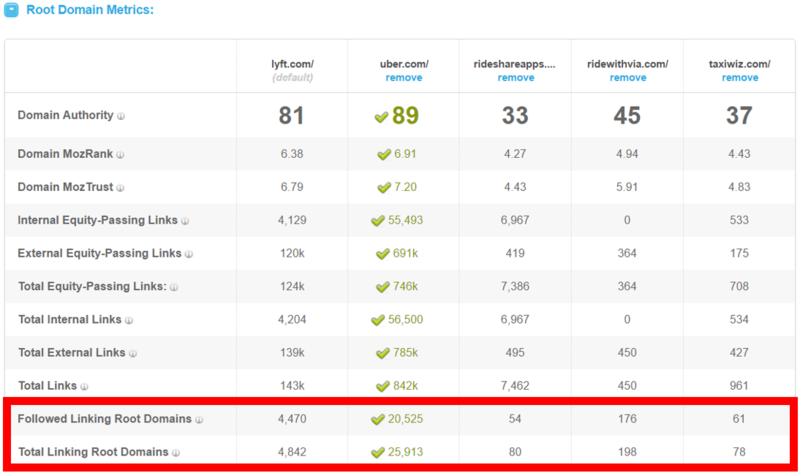 Lyft’s top 5 organic keywords from SEMrush are branded opportunities. I’d bet there’s a lot of voice searches for a term like this, too. 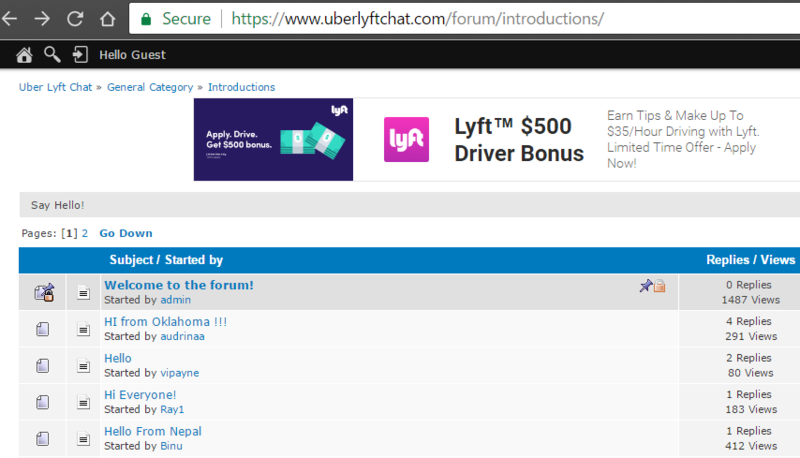 They’re also ranking #1 for “free rides” with their coupon landing page. Again, a smart strategy from Lyft. It always grinds my gears when people think of SEO as a “silo” channel. As search engine algorithms focused more on user engagement metrics and less on how many keywords are stuffed into a landing page template, the impact of brand authority, content, social, P.R. and e-mail has become more important than ever before. This could potentially be seen as a “risky” strategy by some P.R. enthusiasts, but it actually turned out to be brand buzz gold for Lyft. They took a firm stand on a controversial trending topic, and it yielded tons of great links from authoritative sites like Mashable and Fortune. To be clear, a “dead link” in this context means a link that was once live and indexed but is no longer there. The referring page still exists, but the link was removed. The referring page no longer exists (404). 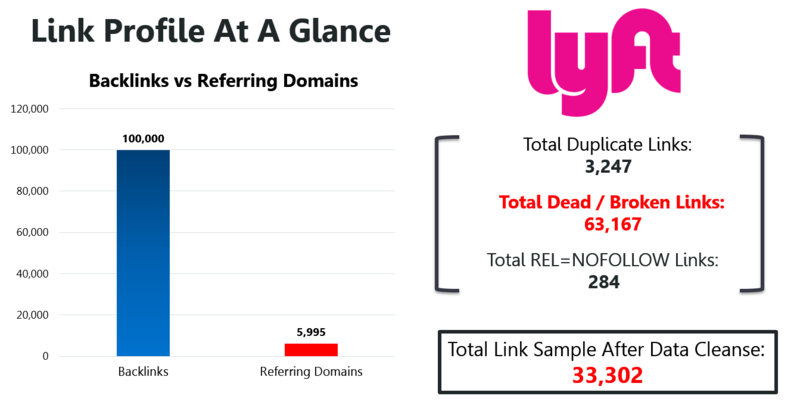 In the case of a popular site like Lyft, it’s very possible that a large number of site-wide links were dropped from the time the link data was collected versus the time it took me to crawl the links and complete the analysis. Let’s see where some of these dead links are coming from. 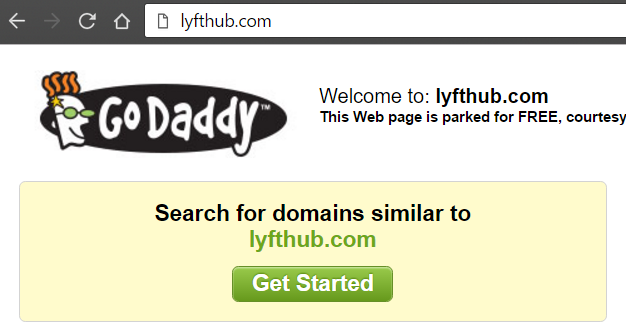 I think most SEOs would agree that it’s quite natural to a see a site such as Lyft.com with an abundance of referring domains at DA 40. 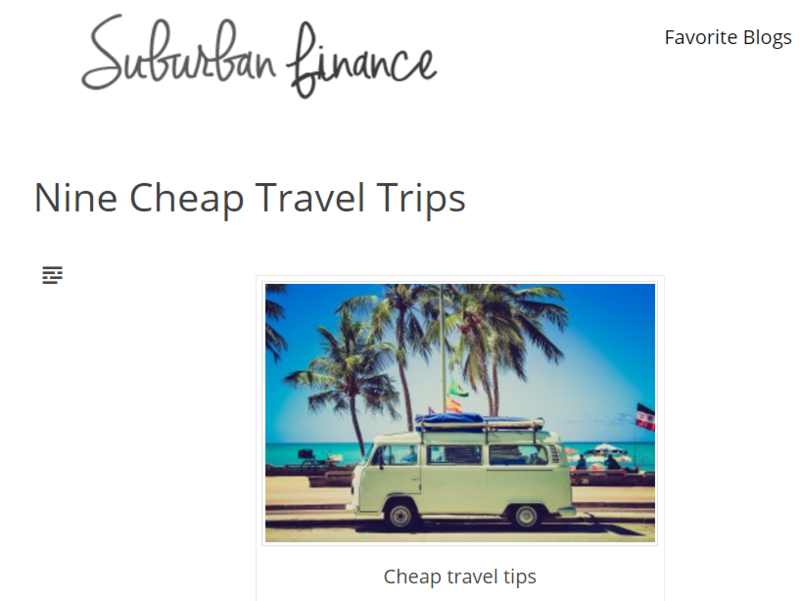 Very common link from a typical mid-tier personal finance blog. Lyft can naturally attract links from authoritative domains based on newsworthy, headline-style P.R. efforts. CNBC published a story on Lyft’s efforts to compete with Uber. 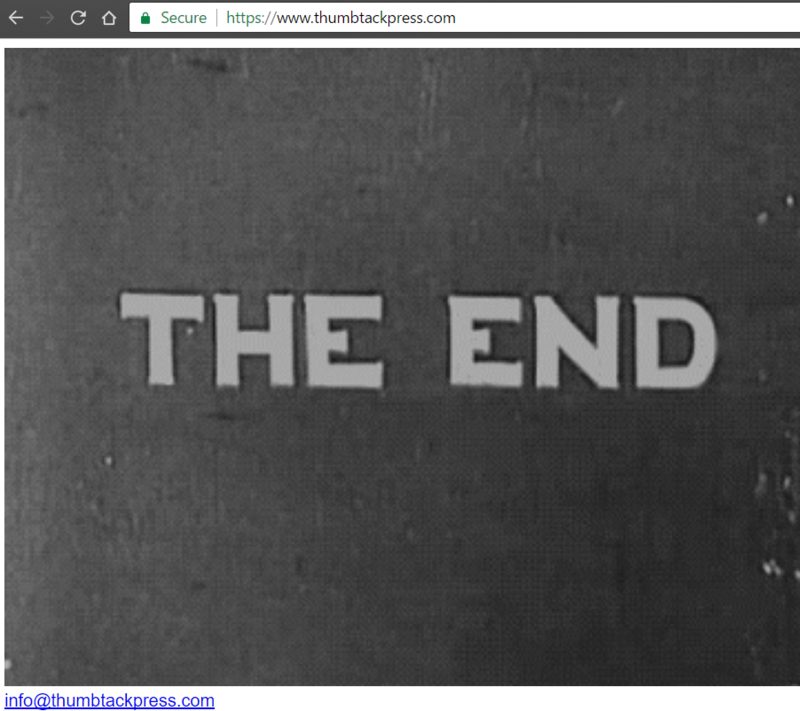 This was actually a cool piece of user-generated content. 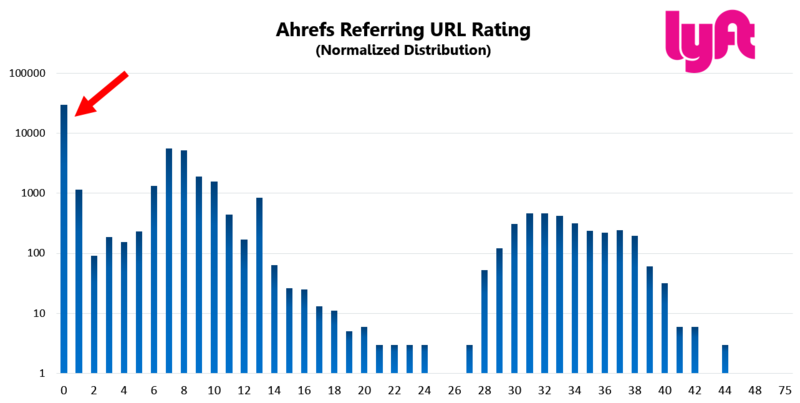 The URL rating distribution from Ahrefs skews heavily toward the low end, with a cluster at the 7-9 range and a second surge of links at 30-38. Given the spike at 0, we can conclude that most backlinks from the Ahrefs index are of lower quality. 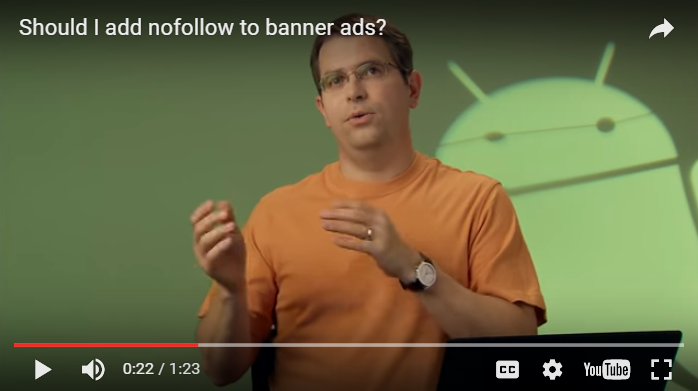 Typically, for any kind of paid link, Google recommends a nofollow on those to draw a line in the sand. That said, search engines have gotten really good at understanding how to best interpret these. Google is smart enough to know that these links aren’t contextual and won’t place as much value on them. 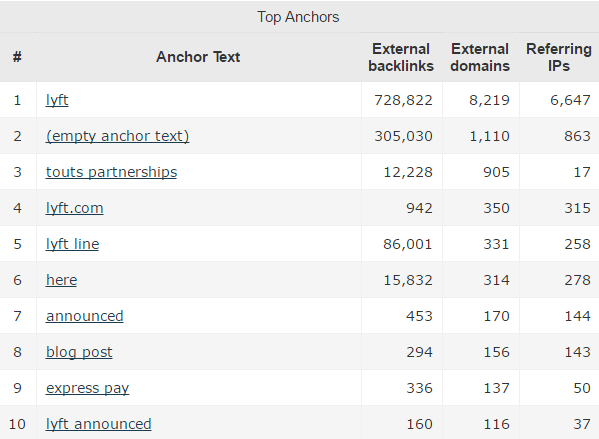 Heavily branded anchor text aligns with the top organic keywords. Nothing about their anchor text profile seems unnatural. P.R. has a massive influence on backlinks! Continue finding ways to be relevant in the news. 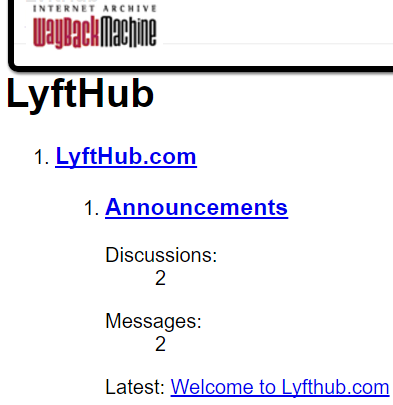 Continue to differentiate from Uber; most of the time when a given site links to Lyft, it links to Uber as well. Invest in content that will earn diverse anchor text links. Focus on keyword research to find non-branded opportunities. 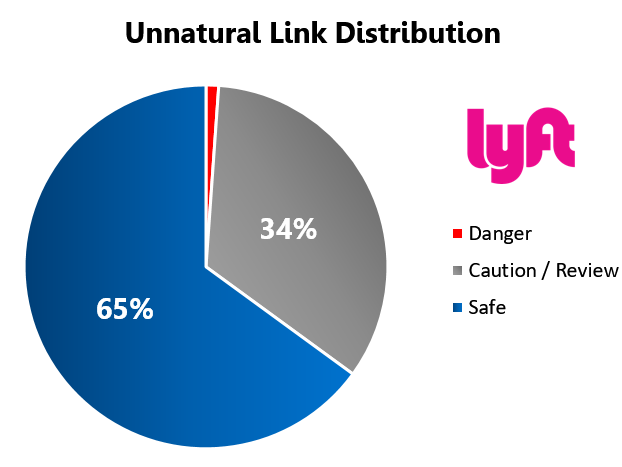 While Lyft is at low risk for link penalization, there’s still a lot of opportunity to improve their Content Strategy by focusing on non-branded opportunities. Lyft is ahead of the small fish, but Uber still remains the leader here. 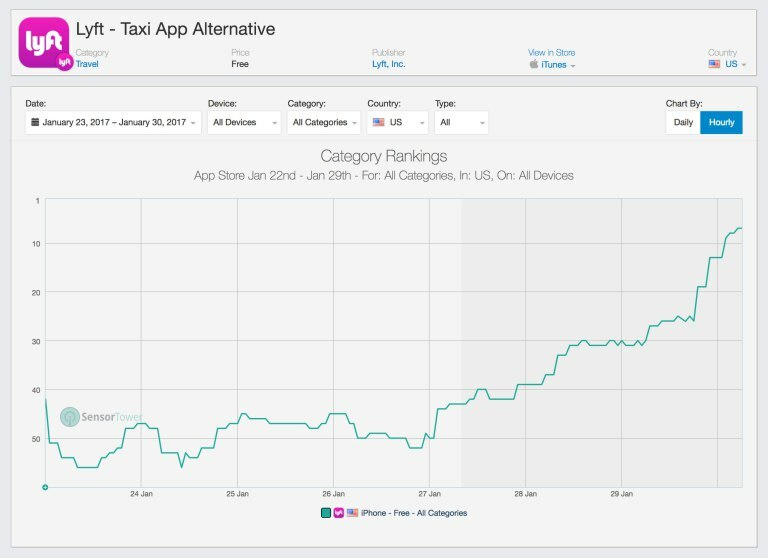 In most cases where Lyft earned a link, Uber earned one, too. Standing out and differentiating is key. 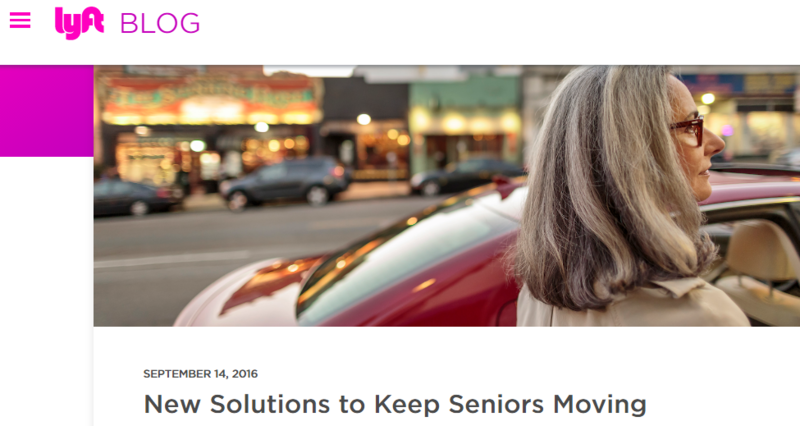 For example, this program to “keep seniors moving” was one of the top linked pages on their blog. Campaigns such as this will be the right approach going forward. An SEO-savvy in-house marketer with technical chops can likely work with Lyft’s P.R and development teams to implement these recommendations. If you’re a marketer looking to improve your link game, check out our ultimate guide to link building. Do You Really Need to Write 1,890-Word Blog Posts to Rank on Page 1?